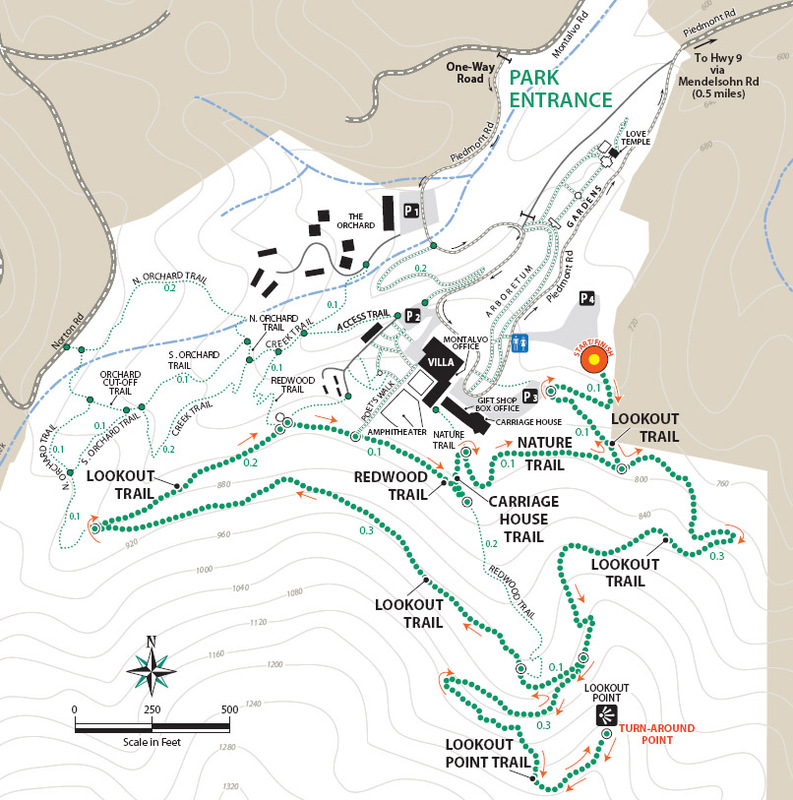 This route is rated as being moderately strenuous and follows the Lookout Trail, Lookout Point Trail, Redwood Trail, Carriage House Trail, and Nature Trail. The orange X's above show the route followed by this hike. 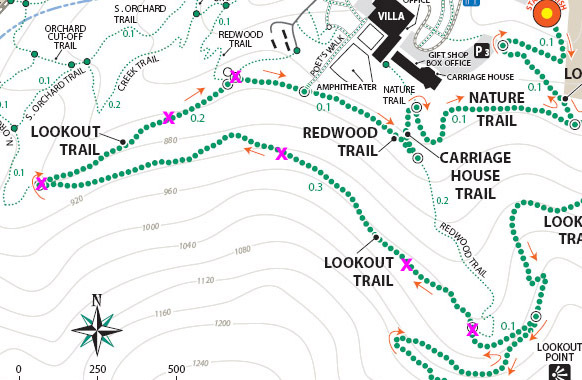 It follows part of the Healthy Trails route to Lookout Point, but takes a shortcut up the Redwood Trail instead of taking the longer section of the Lookout Trail. The lower part of the Lookout Trail runs through a mixed forest of oak and bay laurel. Ahead is the junction with the Nature Trail. The group takes a right turn on the Nature Trail, but the Healthy Trails route continues straight on the Lookout Trail, which will be shown below. The Nature Trail joins the short Carriage House Trail, which switches back and begins a steeper ascent of the hill. Long vines hang down from the trees, like in a jungle. The Healthy Trails route descends the Carriage House Trail and the Nature Trail, so this part is backwards from the prescribed route. The Carriage House Trail ends at the Redwood Trail. The group ascends the moderately steep Redwood Trail to the Lookout Trail. This section is not on the Healthy Trails route. It is shorter, but steeper than the prescribed route, but it is worth exploring as it runs through a beautiful redwood forest. 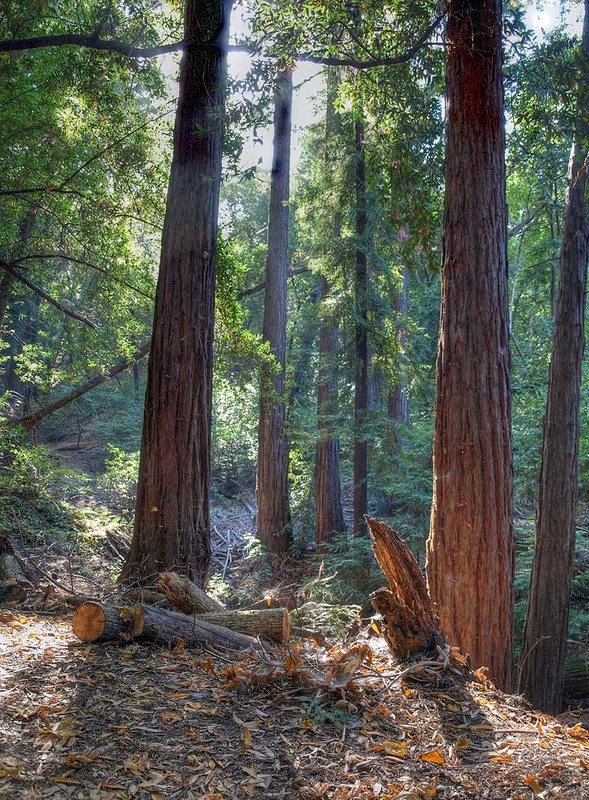 The Redwood Trail ascends through a shady redwood forest. Continuing the ascent on the Redwood Trail. Continuing the uphill climb on the Redwood Trail. The Redwood Trail is approaching the junction with the Lookout Trail. This is the Lookout Trail, heading up to its junction with the Lookout Point Trail. The trail makes a sharp switchback at the junction of the Lookout Trail (right) and the Lookout Point Trail (left). Ferns line this part of the Lookout Point Trail. Continuing on the Lookout Point Trail. Finally, the trail leads to Lookout Point, which is an open area, covered with chaparral. There is a bench here at Lookout Point. View looking towards Moffett Field and San Francisco Bay. View looking towards downtown San Jose. In this view, Mount Hamilton is on the upper left. The Evergreen Hills are below it. Santa Clara Valley Medical Center is in the middle. This view is looking towards the Los Capitancillos Ridge, with the Santa Teresa Hills, and the Mount Hamilton Range behind. Los Gatos and Saratoga are below. The Lookout Point Trail deadends at Lookout Point, so you have to backtrack down the trail. On the return trip, this is a view looking back down the Lookout Point Trail. This part of the Lookout Point Trail goes through a forest of young redwoods. The Lookout Point Trail passes by a hillside covered with ferns and vines. Looking down at the Lookout Trail. This is the junction of the Lookout Trail (left) and Redwood Trail (right). Most people backtracked along the Redwood Trail to the trailhead. I followed the Lookout Trail straight ahead, which is the Healthy Trails route. The route I followed below is shown by the magenta X's above. Continuing northwest on the Lookout Trail. The vegetation along the trail opens up in places, with views of Saratoga. More shady forest along the Lookout Trail. Ahead are 2 bridges over a creek. The upper bridge is on the Lookout Trail near the start of the Orchard Trails. Below is a bridge along the lower Lookout Trail. The lower bridge on the Lookout Trail. 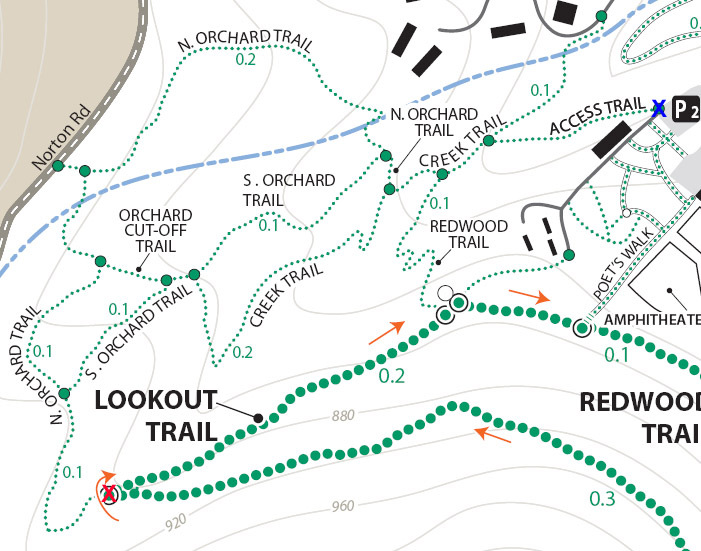 The Lookout Trail makes a sharp switchback as it joins the Orchard Trail. 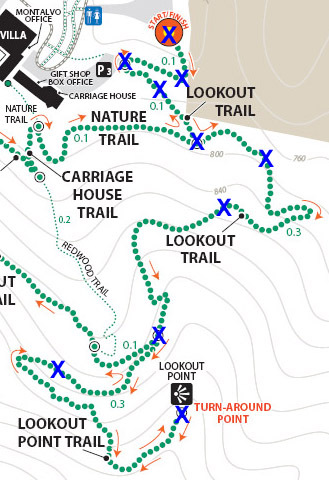 Note that the Healthy Trails booklet and and new park map refers to both as the Lookout Trail, but the old park map refers to the trail on the left as the start of the Creek Trail. This picture was taken from the start of the North Orchard Trail, which will be covered later. Bridge on the Lookout Trail. Looking back at the bridge, this part of the Lookout Trail runs along the steep canyon of Wildcat Creek. This is next to the trail above the creek. It is actually a work of art. It is called "Nest" by artist Steven Siegel, made in 2005. It consists of stacked newspapers in a circle of bay laurel trees. The trail runs by an old concrete building that appears to be part of the water system. At a covered reservoir, the trail reaches the junction of the Creek Trail and an an access trail (left) leading to parking lot P2. The Redwood Trail begins on the right. These pictures below were taken on 9/5/11 and 8/04/12 during hikes along the Nature and Redwood Trails. The violet X's show the route followed below. The pictures below were taken on 8/5/12. They cover the start of the Healthy Trails route not taken in the previous hikes. It follows the Lookout Trail to Lookout Point and back. The blue X's show the route shown below to Lookout Point. This is the start of the Lookout Trail at the end of Parking Lot P4. This is the start of the Healthy Trails route. The trail climbs gently uphill. After 0.1 miles, the trail reaches the Belvedere at the end of Parking Lot P3. The hill around the Belvedere has been recently cleared. At this time, there is a new art installation, called "you are here...man, mountain, valley, sky," by artist Kianga Ford and sound artist Mamoru Okuno. They call it a site-specific audio experience. You can listen to music and narration at different spots on the route, which ends at Lookout Point. You download the sound into your MP3 player for listening, except at the Belvedure, where the sound is played on speakers. A new staircase has been built to reach the Belvedere from Parking Lot P3. The building in the distance is the Carriage House, which contains a theater. Taking the Lookout Trail uphill from the Belvedere, it reaches the junction with the start of the Nature Trail (right). Continuing straight on the Lookout Trail from the junction, the trail runs through coyote brush and oaks. 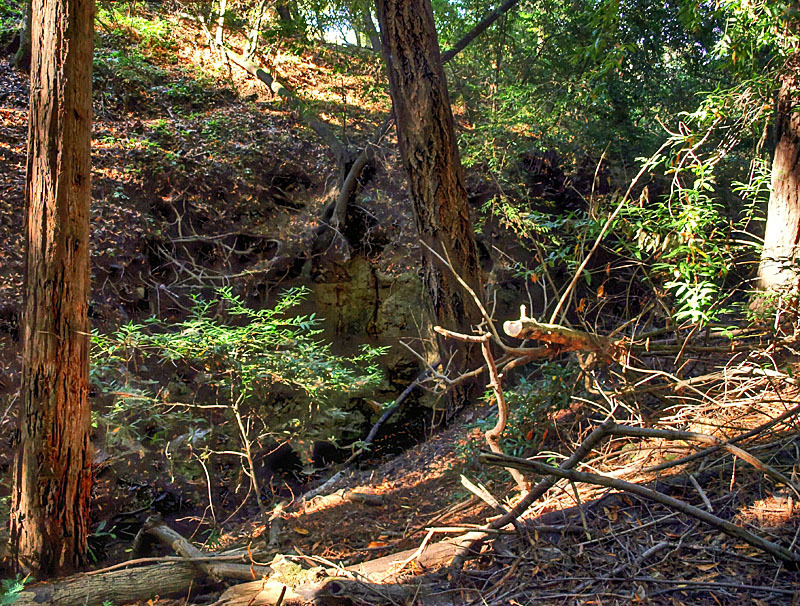 The trail bends around a shady ravine. As the trail climbs upward above the trees, glimpses of the distant scenery can be seen. The Lookout Trail reaches a clear area, which is a listening point for "you are here...man, mountain, valley, sky." It has views north, looking up the Bay. The trail enters a shady redwood forest. It continues up through the redwood forest. The trail enters a madrone forest. On the right is a madrone tree. On the left in the distance are redwood trees along the Redwood Trail. The madrone trees have peeling bark. The trail begins to enter a sunnier section with bay trees and coyote brush. The Lookout Trail starts to approach a shady forest. The trail enters a tunnel of trees at the junction of the Lookout Trail and Lookout Point Trail, seen previously. This switchback is on the Lookout Point Trail. Lookout Point has changed since April, 2012. The "you are here..." exhibit has stone chairs for viewing sights of the valley, while listening to downloaded narration and music on your MP3 player. This is a view looking back from Lookout Point into a tunnel of trees. Heading back down the Lookout Point Trail. Back at the trailhead at Parking Lot P4. This trail route starts at the red X on the lower left and ends at the blue X on the upper right. It covers all the orchard trails and part of the Creek Trail. The North Orchard Trail begins at the switchback in the Lookout Trail seen above. It follows along the steep bank of Wildcat Creek. The North Orchard Trail crosses over Wildcat Creek, which is dry in the summer, then climbs up above the creek canyon on the north side. In 0.1 miles, the North Orchard Trail reaches the start of the South Orchard Trail (right). This will be taken later. Continuing on the North Orchard Trail, it passes through a young oak forest. After 0.1 miles, it reaches the Orchard Cut-off Trail, which is a shortcut to the South Orchard Trail. The North Orchard Trail crosses over a small creek on a bridge. The North Orchard Trail reaches this trail entrance on Norton. There is no parking on Norton Road immediately adjacent to this trail entrance. It is primarily used as a neighborhood entrance for the local residents. The North Orchard Trail crosses over another bridge over a small creek and enters a sunny, open area, the site of a former orchard. This is the view looking downhill from the top of the orchard area. This is a view downhill from the middle of the orchard area. This is a view looking back uphill from the middle of the orchard area. From the trail, you can see the rooftops of the Lucas Artists Residences, which are private. Access is restricted. The trail skirts around them. The trail enters a shady canyon again and crosses over a small creek on the bridge on the left. The North Orchard Trail reaches the junction with the South Orchard Trail, then in a short distance, goes downhill to meet the Creek Trail, shown above. Backtracking a little, this is the South Orchard Trail, which climbs up the south bank of Wildcat Creek. In some places, it has steps like these. This is the South Orchard Trail along the edge of the hillside above Wildcat Creek. 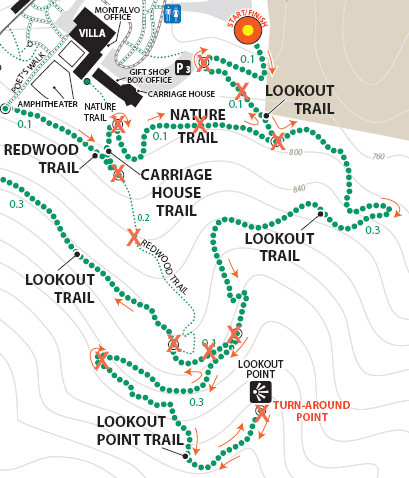 The top of the South Orchard Trail runs mostly through partially shaded forest of madrones. I crosses the start of the Creek Trail. A short distance later, it crosses the Orchard Cut-off Trail, which leads to the North Orchard Trail. It continues for 0.1 miles to reach the North Orchard Trail. This is the start of the Creek Trail, which branches off of the South Orchard Trail. It descends the canyon to reach Wildcat Creek. This is the Creek Trail, which runs next to Wildcat Creek along its north bank. 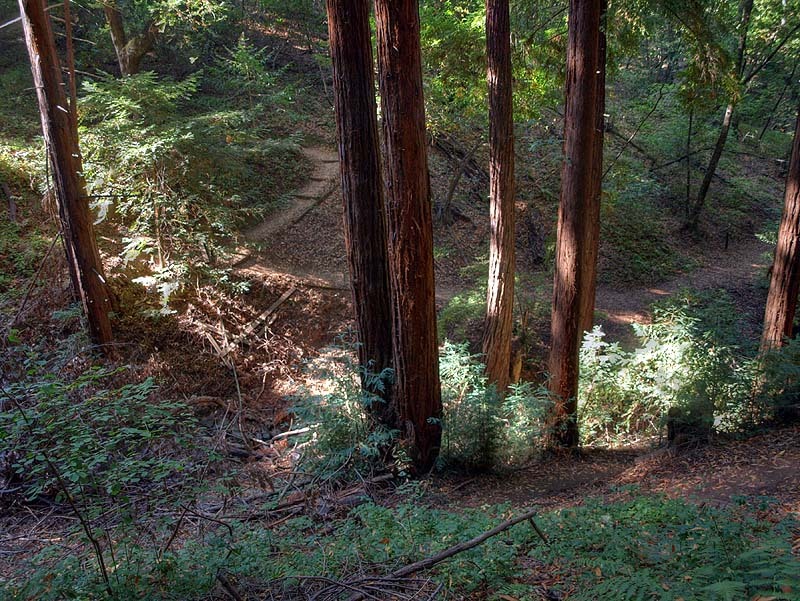 Looking across the creek, these are the switchbacks of the Redwood Trail seen below. The Creek Trail passes the junction with the North Orchard Trail, seen above, then crosses over Wildcat Creek on this bridge, where it meets the Redwood Trail seen below. The Creek Trail reaches the Access Trail (right). While it looks like the Creek Trail continues on the left, it actually ends after crossing the bridge over Wildcat Creek because it leads to the artists' residences, which are closed to the public. This is the Access Trail leading up to Parking Lot P2 next to the Villa. It passes by this old stone storage shed ahead. Shown below are HDR pictures taken on 9/5/11 in one of the shadiest and most scenic parts of the park. 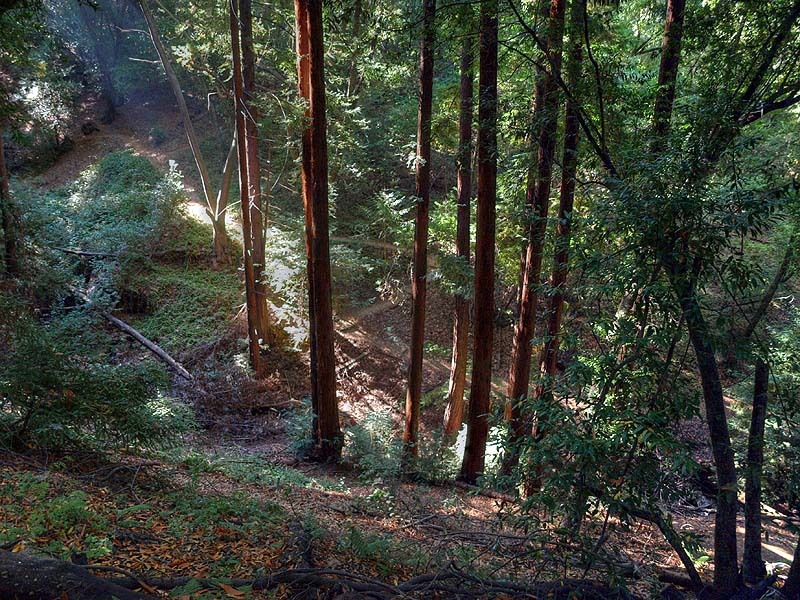 They start at the Redwood Trail, below the junction of the Lookout Trail. 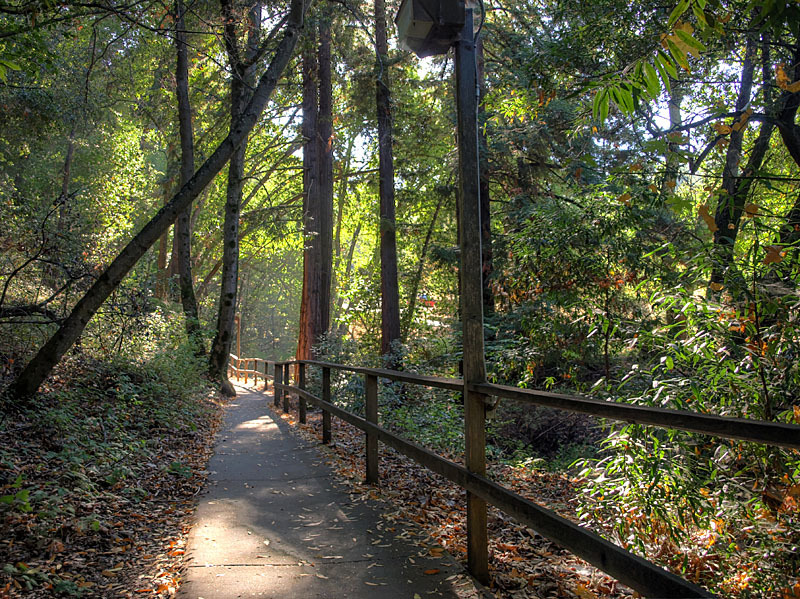 The Redwood Trail leads to the Creek Trail. The Creek Trail intersects the Orchard Trails. Note that this is not on the Healthy Trails route, but can be taken as an extension to the route. The route followed below is shown on the map above in the light magenta X's. This is near the top of the Redwood Trail. It descends the hillside in a series of switchbacks. On the other side of the creek is the Creek Trail, seen above. This is a view from lower down on the Redwood Trail, looking up Wildcat Creek, with the Creek Trail on the right. 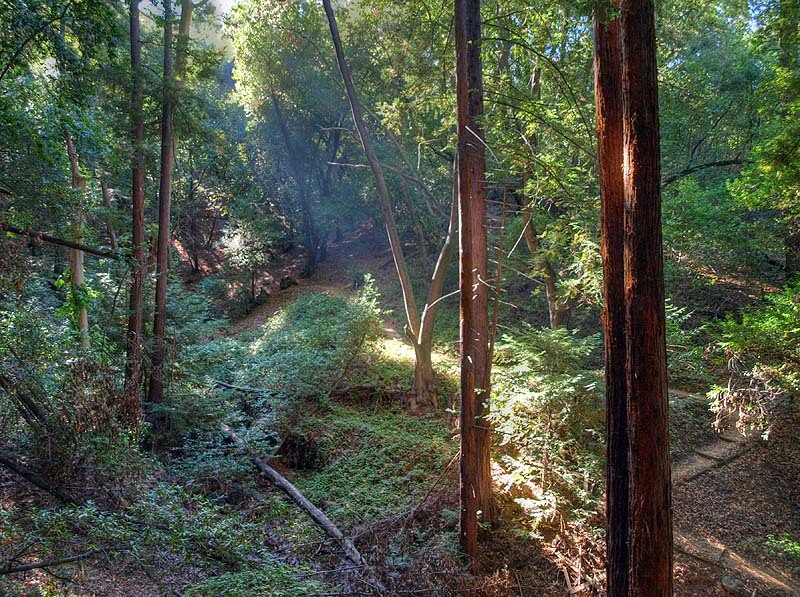 View of the Creek Trail from the Redwood Trail. Another view of the Creek Trail from a little farther along the Redwood Trail. 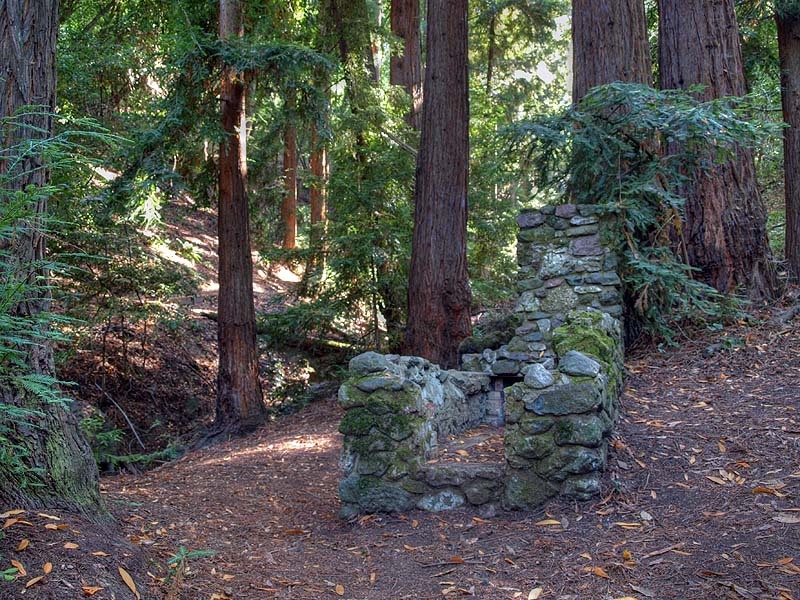 This old stone BBQ pit is on the Creek Trail, near its junction with the Redwood Trail on the left. Redwood trees along the Creek Trail. There's a steep rock face on the other side of Wildcat Creek. The Creek Trail no longer ends at the park road. It leads to the artists' residences, which are private property, and access is restricted. 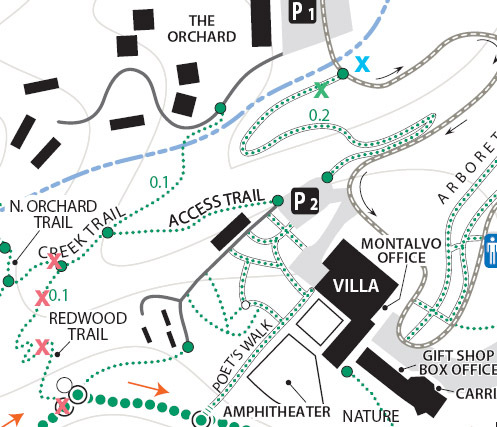 Instead, take the Access Trail, which leads uphill to Parking Lot P2. Starting from the main park road, this paved walkway leads along the creek, on the other side of the creek from the artists' residences. It switches back and climbs up the hill, ending up at parking lot P2. It is indicated by the green X on the map above. 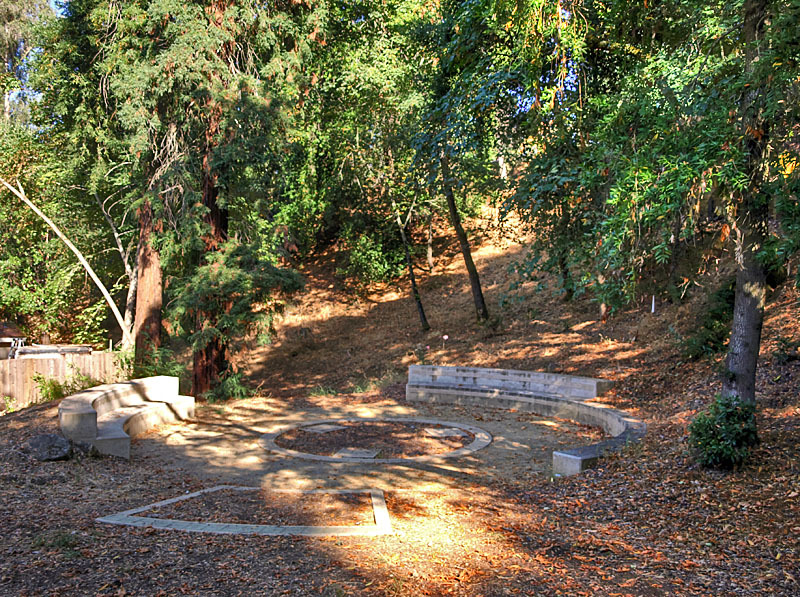 This circle is part of the Creekside Studio. 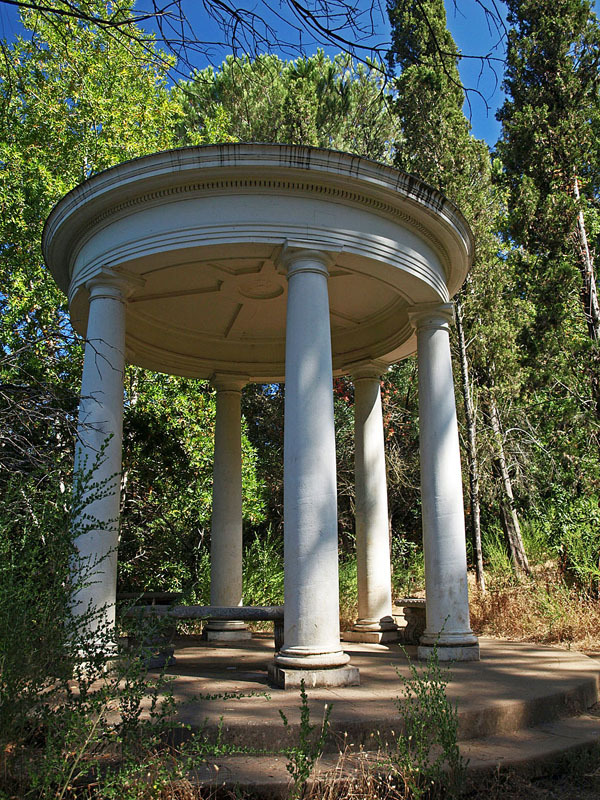 It is in the "Grove of Generosity," which honors the donors to the Montalvo Arts Center. It is indicated by the Blue X on the map above. 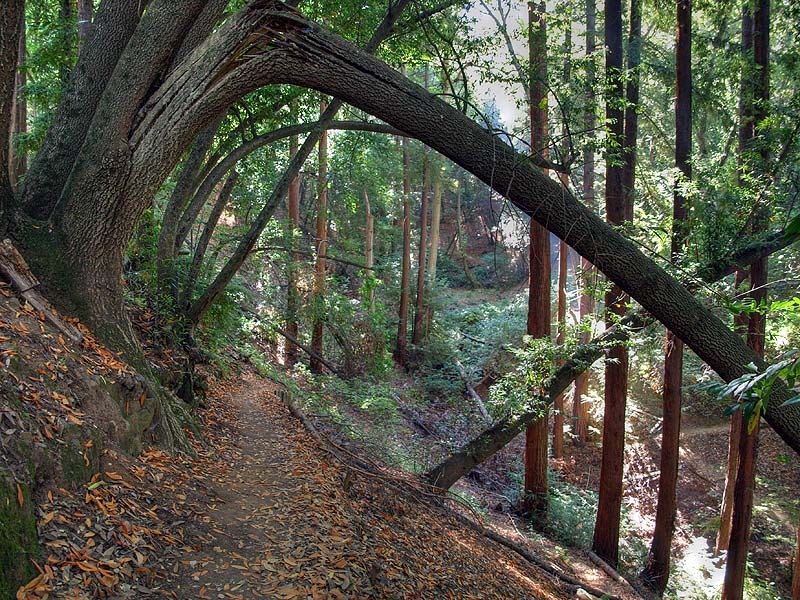 These are all the hiking trails in Villa Montalvo. To see the paths and walkways associated with the villa and formal gardens, see the Villa and Gardens page.